Ladies and gentleman, don’t pinch yourselves. Your eyes do not deceive you. This is actually real… a non-Halloween season update! Of something we regularly cover! That you’re actually interested in! 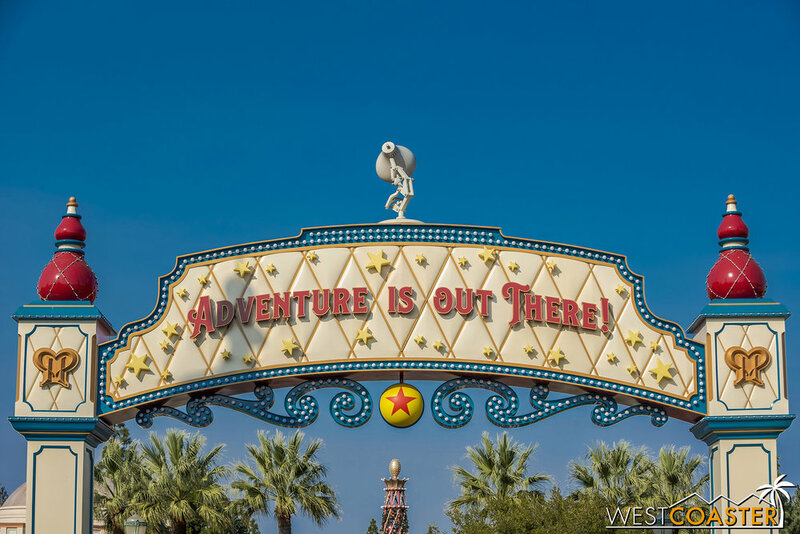 Yes, we’re returning to the Disneyland Resort after a two month hiatus resulting from our plethora of haunted attractions visits and catching up with what’s transpired during this time. 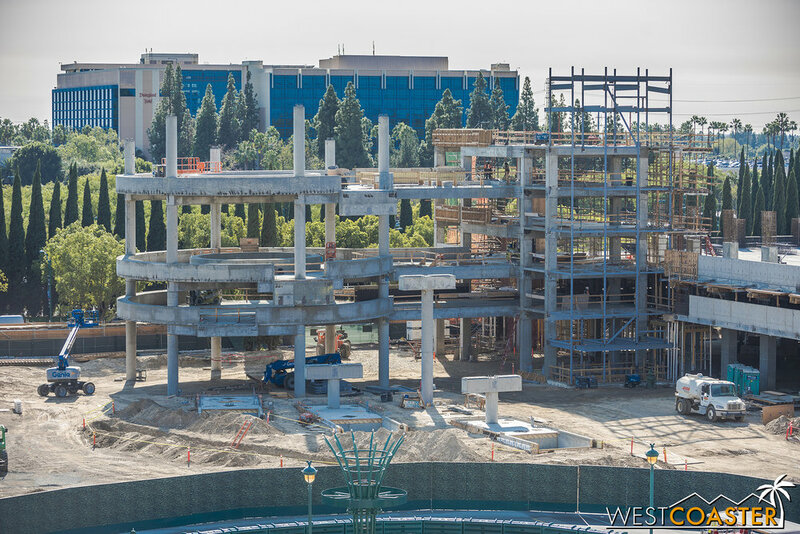 We know that change could be slow to become apparent when we were posting Disneyland Resort construction updates every week or other week. But over numerous weeks? Progress becomes more apparent. So come join in our magical journey through what’s happened at Disney since we last checked in! 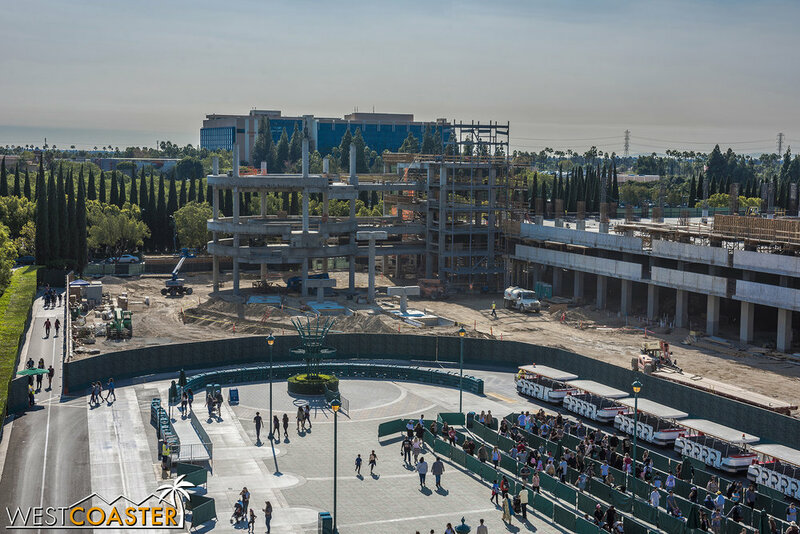 The fastest visibly moving project on property continues to be the new neighboring parking structure next to Mickey and Friends. 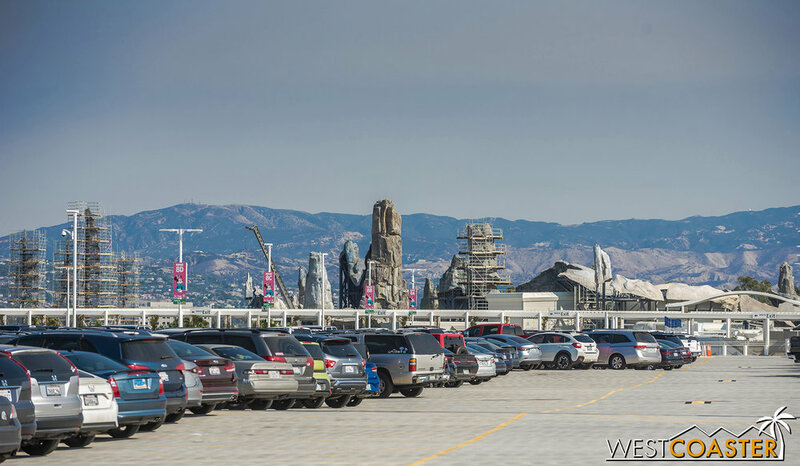 It is urgently needed, since parking and traffic is already often a mess at the Resort and will only get worse when the throngs of superfans flood Disney next June when Star Wars: Galaxys’ Edge opens. 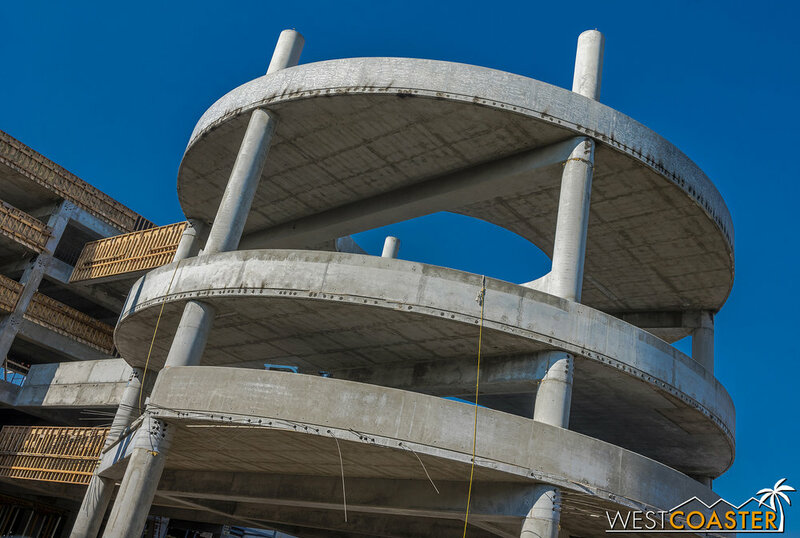 In two months, the parking structure has added two levels, and construction is absolutely flying. The crew continues to work extended hours, and concrete has moved up to anywhere from the third to fifth floor, depending on which part of the structure you’re checking. The escalator promenade is also taking better shape, so we’re also seeing a bit more personality come forth from what is mostly a plain, boxy parking garage. The pace and amount of construction is certainly impressive, and it’s exciting to watch! Hey, it’s that parking structure we’ve been looking at this past half year! The structure has definitely grown since we last checked in. About two stories of growth, in fact! This bridge to the original structure is now up to the fifth level! Here’s an escape ladder. But also, soon to be emergency stairway. The tower is getting pretty massive! Over on the top floor, they’ve marked out the location of existing rebar on the Mickey and Friends side, so that they can avoid cutting it and also know where to tie in the new structure. Look at all that rebar waiting for concrete! The ramps going up present a familiar traffic system. 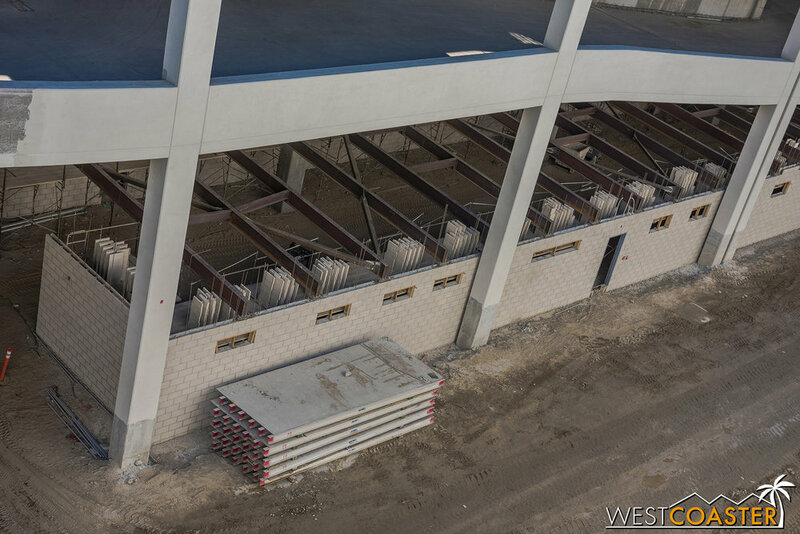 Here are a bunch of close-up’s of the new structure. 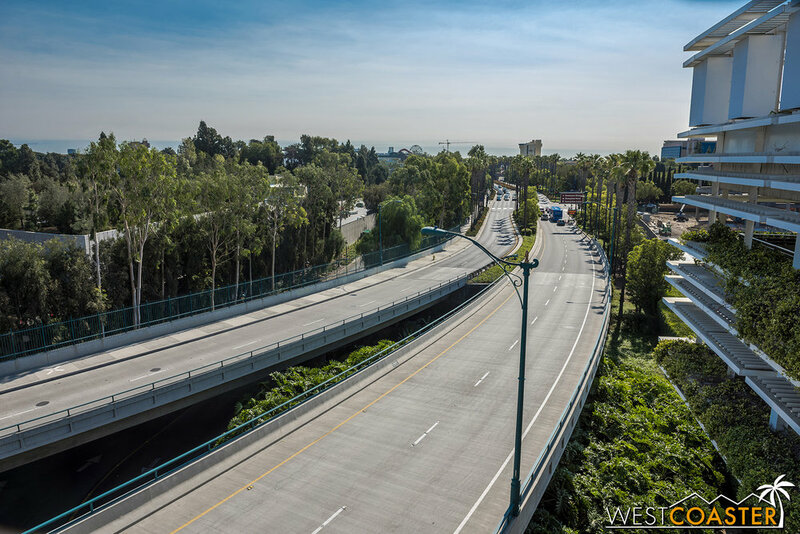 Over to the back side, the bridge on the west end of the parking structures providing a connection between structures. Looking back to the east. A extending fork lift raises a concrete formwork panel to the top. Hmmm… this column rebar seems a little lean-y…. Looking beyond. The more southwest, the less complete. But there is already plenty done. The circular elevator promenade decks look interesting. The pits in the ground will be where the escalators come down to the tram loading plaza. They’re erecting the structure for what will be the elevator tower on that side. It will basically turn out like this existing guy. 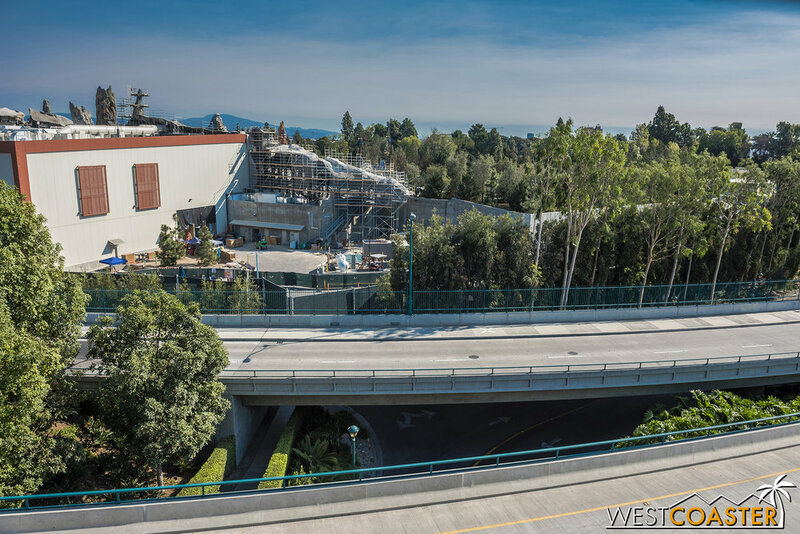 Here’s the escalator promenade from the corner of Disneyland Drive and Magic Way. It’s definitely changing view lines! Also, rocks continue to rise up and be completed. There’s much more progress in the interior of the land, though. We just can’t see it. Lets pan around our Star Wars construction site again! They’re just finishing the rocks at this point—at least in terms of visible work to the public. Smugglers will be Running here. Just a few more rock spires to go. There are a few wall panels that could use some replacement. Kind of funny to see the naked spires stretching upward. Over on the Critter Country side of Star Wars: Rise of the Resistance, more rockwork has gone up, obstructing the view of the Parking Structure from within the park. Just gotta complete the details. This opening is still there, just more covered up. But not fully! You can see the rockwork finishing wrapping from the park side. 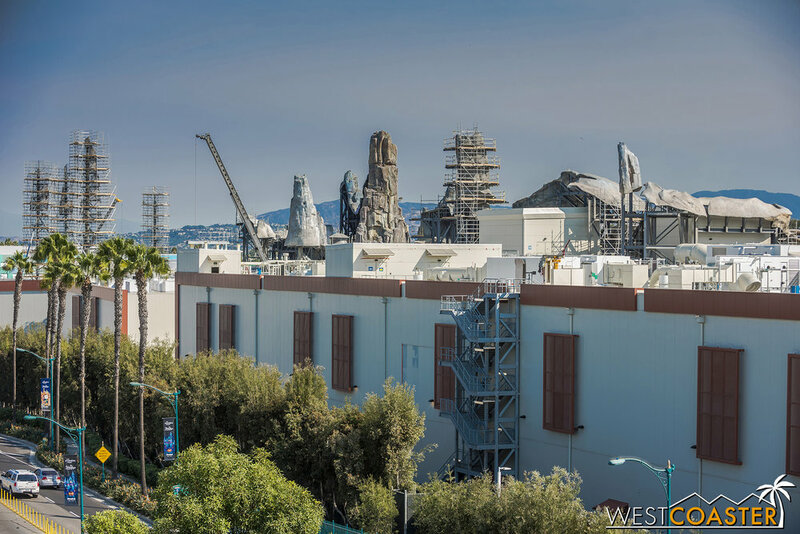 Can’t wait to see Star Wars: Galaxy’s Edge in its finished form! The last time we checked in on Downtown Disney, the new “4-diamond” hotel project had been postponed indefinitely as a result of Disney’s dispute with the city of Anaheim over tax breaks and technicalities. Well, last month, Disney officially pulled the plug on the project, leaving the west side of Downtown Disney in a bit of a limbo. What to do with the shuttered big box tenants? Well, things are certainly awkward, ESPN Zone and AMC Theaters don’t look to be returning anytime soon or at all. Rainforest Cafe might. And Starbucks DtD West will. But they did almost sheepishly reopen Earl of Sandwich! So that’s something. It’s officially temporary for now, but it would make no sense if Disney failed to make it permanent. Hey, that means you can get your Holiday Turkey Sandwiches just in time for the season! Hooray! The empty Rainforest Cafe has expressed interest in returning to its old location. Earl of Sandwich is back! Yay! AMC Theaters will not be back. Neither will the Disney Vacation Club. 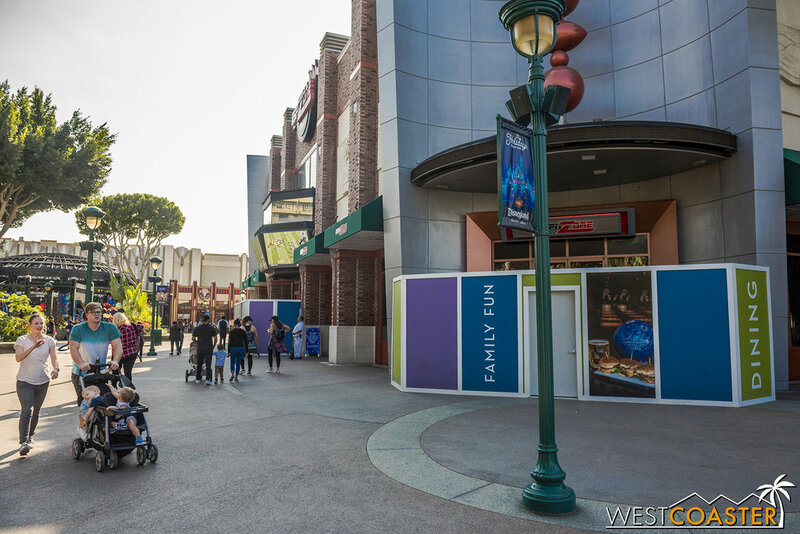 The work walls that were hiding the circulation re-routing for Downtown Disney guests are down, though! But some have moved to this side. Once upon a time, diverting guests going around the AMC would have gone through these gates to get back into Downtown Disney. Oh, and it looks like this Starbucks location will be coming back after all! 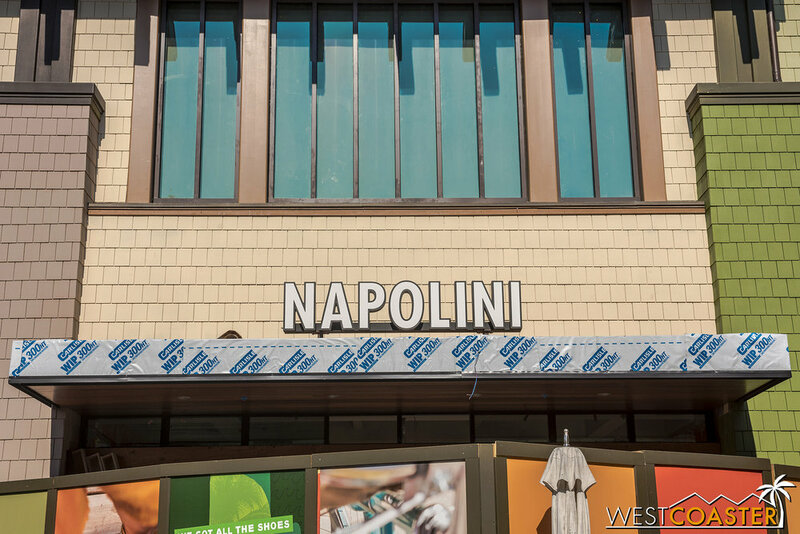 Meanwhile, the same projects we’ve been following over from the former Build-A-Bear to Naples Ristorante are continuing, continuing, finished, and finishing—in that order. Black Tap Craft Burgers and Bear and Ballast Point still aren’t done and show no signs of finishing soon. But Naples is at least mostly done, with just work on its quick serve area outstanding. Ah, November… the months when autumn theming isn’t quite dead yet, but you gotta bust out Christmas! A bit more abstract and elegant. 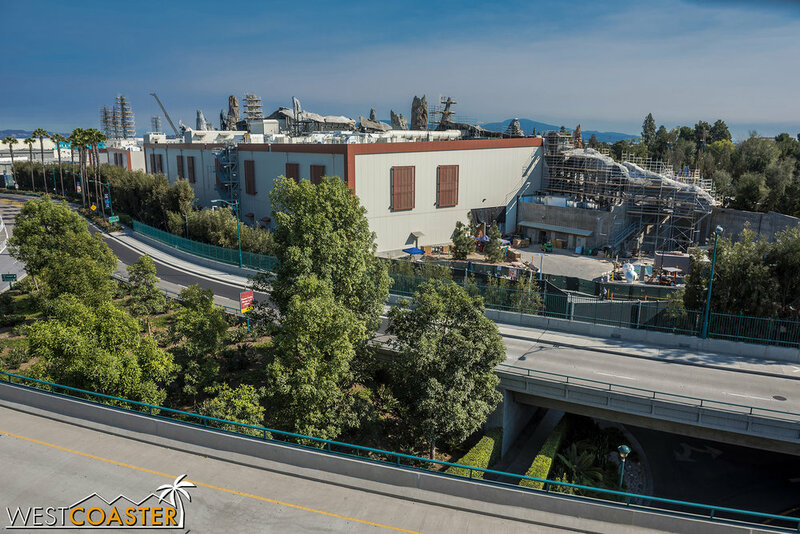 What I thought was going to be the outdoor promenade I had seen in the concept art might be fully turned into interior space. 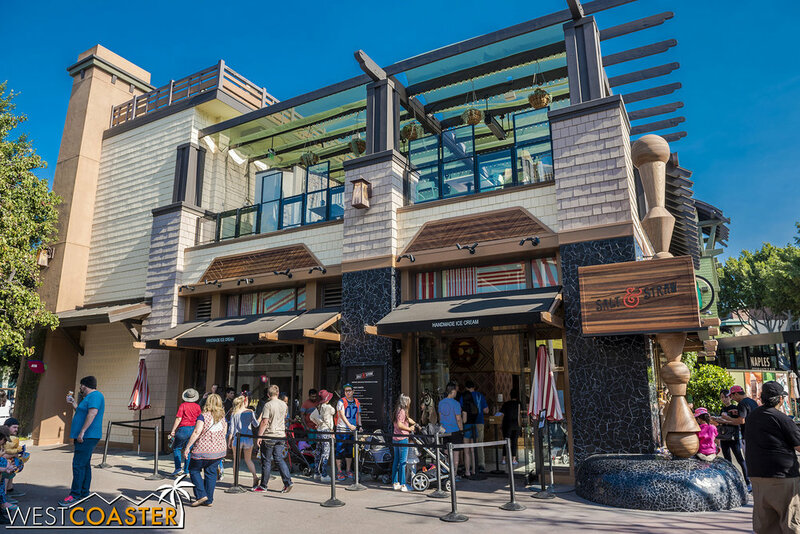 Ballast Point is also finally running work in its construction lobby. The take-out area for Naples is still under construction. So not quite Napolini yet! This should all be completely done soon. Salt & Straw did open last month. It’s a good ice cream place, and it’s kept pretty busy. The Salt & Straw is open! Lines can definitely get long, through they’ve died down in the weeks following this grand opening. Annual Passholder discounts do apply here! 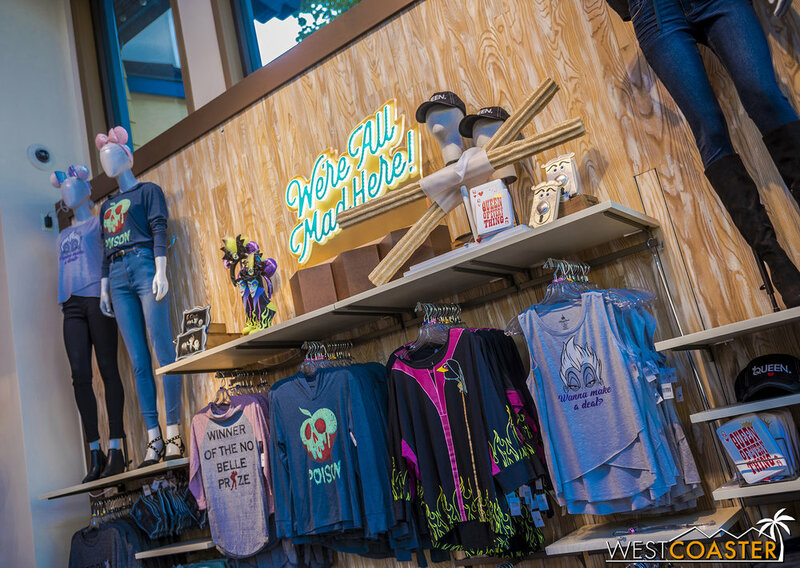 Also fully open in Downtown Disney is the World of Disney Store! The redesign is complete, and the retail space has been streamlined to incorporate a more modern and commercially efficient aesthetic and layout. The whimsical cartoon nature of the old store is gone, though media effects retain some semblance of magic. 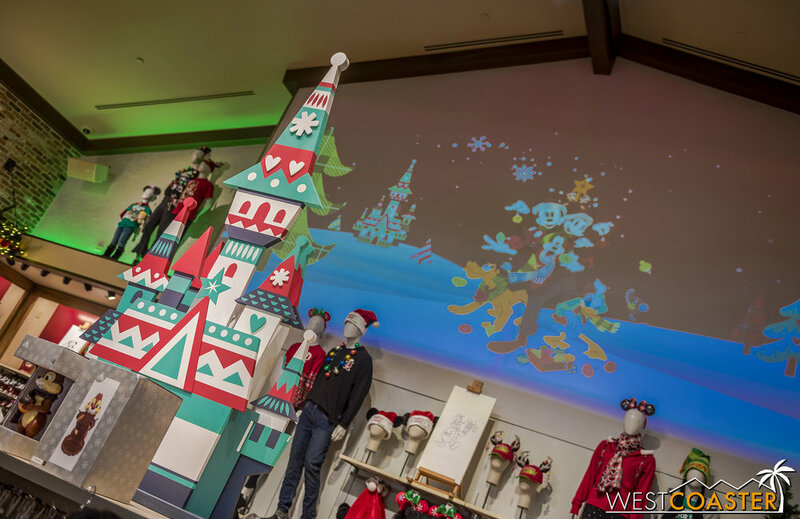 The look is more in line with Disney Springs over in Walt Disney World. The space is more open and flexible, and the products are on more focused display. The redesign may not appeal to everybody. In fact, Instagram still bemoans the loss of charm to the store. But the change was definitely intentional and done to appeal to the retail performance side first, storytelling second. And it is nice. Just not quite as resonant or engaging. 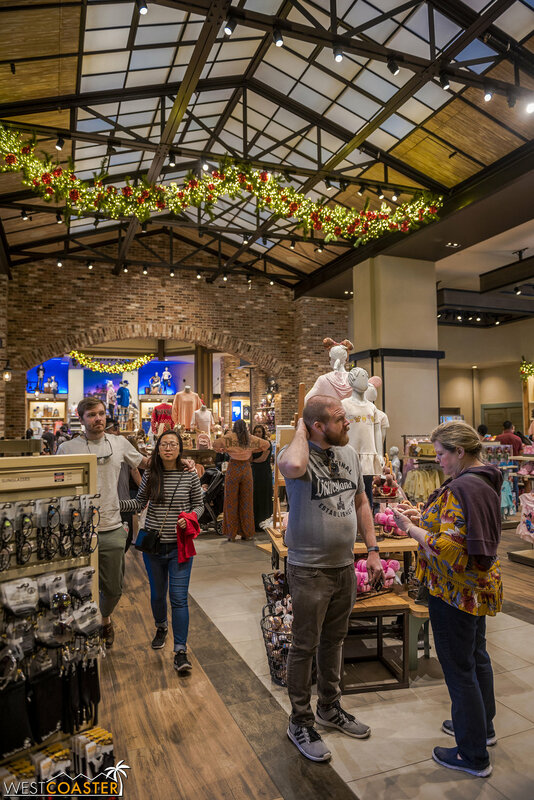 Here’s the new, more contemporary World of Disney store. Even things like the exterior signs are different. The inside does feature a lot of use of digital media. Lots of merchandise clearly organized and labeled. This is cool. Tinker Bell flies across the backdrop and into one of the portraits. That turns the static images into a dynamic one! Christmas in the holiday section. Notice the blank walls behind the cashiers. They look nice from the inside. There are also certain portraits that change with random frequency, providing some “magic” to the guests. This castle, for example, gets fireworks. Elsewhere in the store, a lot of the graphics and arrangements clearly are targeting millennials. Disney swag for that IG life. Downside of the cashier walls? They result in plain, “wood” walls in these displays. I liked the old ones better, especially those that had dynamic movement! It would have been nice to not see the backside of a wall. Ah well. 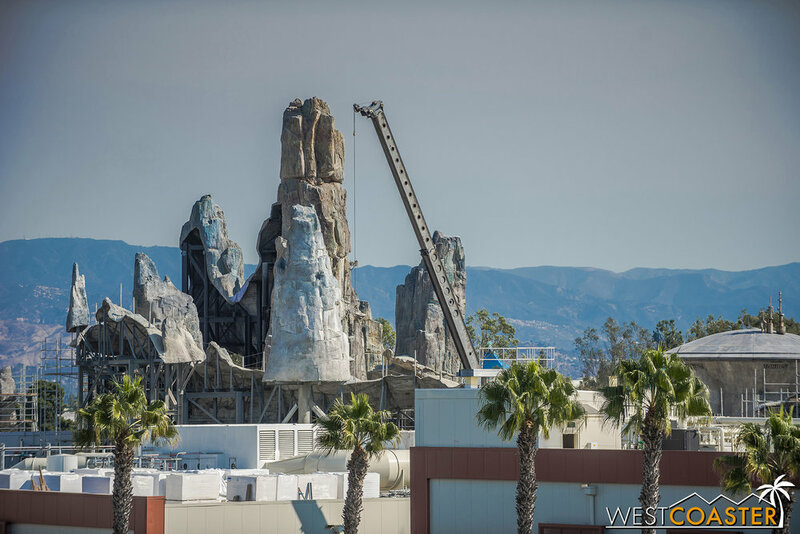 We now bring you the start of our Marvel Land construction update for this edition! So they’re building a Spider Man attraction over there.. I guess that’s ironic, given that it used to be an insect-themed land. 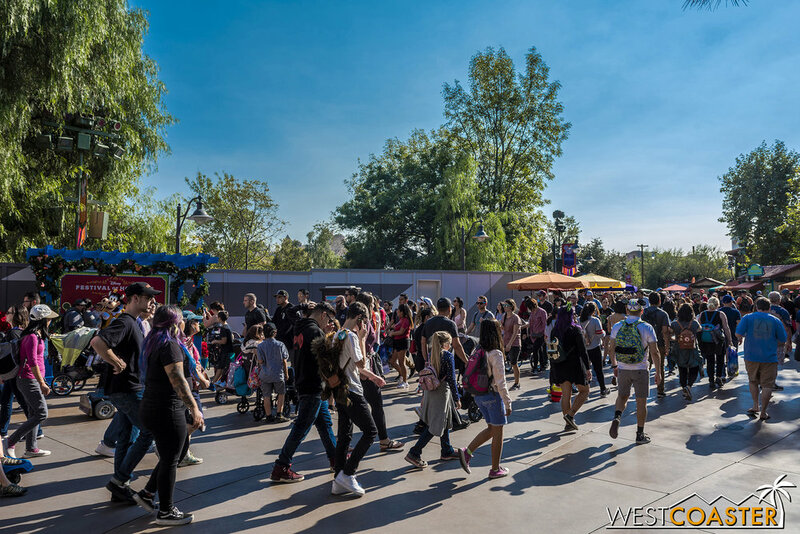 We now conclude our Marvel Land construction update for this edition! 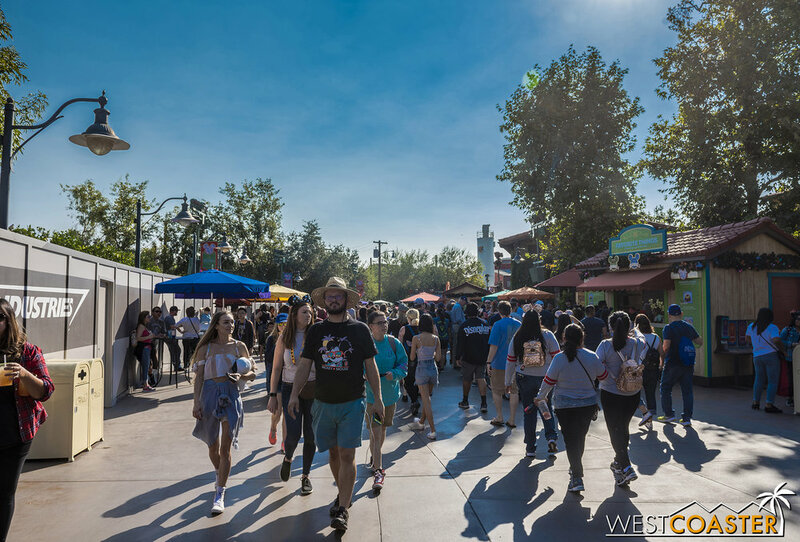 Five months after it was “completed,” Pixar Pier finally has a fully operational and actually finished entryway. 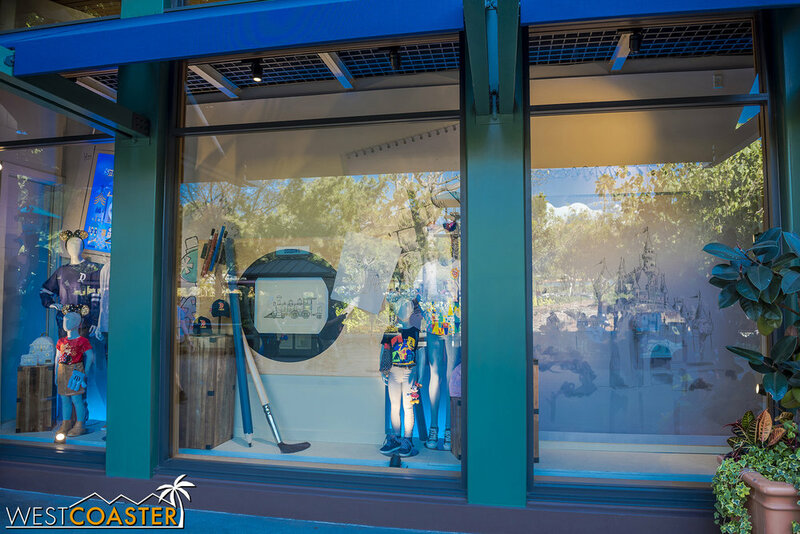 Luxo, the iconic lamp and Pixar logo/mascot, has found a home on the archway over the entrance into Pixar Pier. Looking at hime, one understands why delays happened. He’s not a static statue, but rather a moving animatronic that rotates, bobs, and turns every once in a while. It’s pretty cute, for sure! That’s pretty cool, I gotta admit. Here’s Luxo from the backside. Meanwhile, World of Color continues to be worked on. So even though it’s the holiday season at the Disneyland Resort, there will be no World of Color: Seasons of Light this year. Sad, since it’s a legitimately great production! Also, construction continues on Jessie’s Critter Carousel and is kicking off over at the old Maliboomer Site, where Inside Out: Emotional Whirlwind (see what I mean about IP ride names and colons?) will be located. The area has been cleared of the former giant planters and trees that were previously there. More repairs are needed here. As a result, the Festival of Holidays entertainment has been extended into the evening to make up for the loss of World of Color. A few more stickers and artwork have appeared on the construction walls. Four months in, and the Bing Bong statue STILL hasn’t arrived. 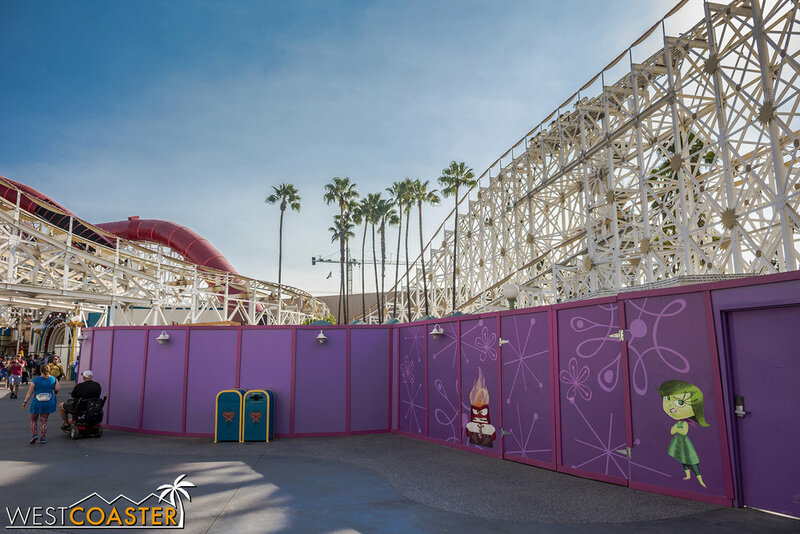 The Inside Out attraction area will be quite different from what Pixar/Paradise Pier has seen before. They’ve cleared out the obstructions so that they can work on the actual ride. This concludes our non-Halloween update and return to the Disneyland Resort. We actually still do have a few more haunts to cover (Field of Screams, Pumpkin Nights, Pageant of the Monsters, the conclusion to our Halloween Horror Nights coverage that we never actually got to—to be specific), but they’ll be interspersed among other updates over the rest of the year. We’ll also be winding into some Christmas updates, since everyone knows that once Halloween passes, Christmas hijacks Thanksgiving’s spotlight and thwacks you upside the head with its presence. Everywhere. In the meantime, we hope you’ve enjoyed this catch-up update. Enjoy a great Sunday, and doo bah! !